Weatherboarding and a quirky roofline distinguish 78 St James’s Street from its rendered, parapeted, neighbours. St James’s Street was developed from around 1790 yet most of the buildings at least appear to be Victorian. An oval plaque on the side of No. 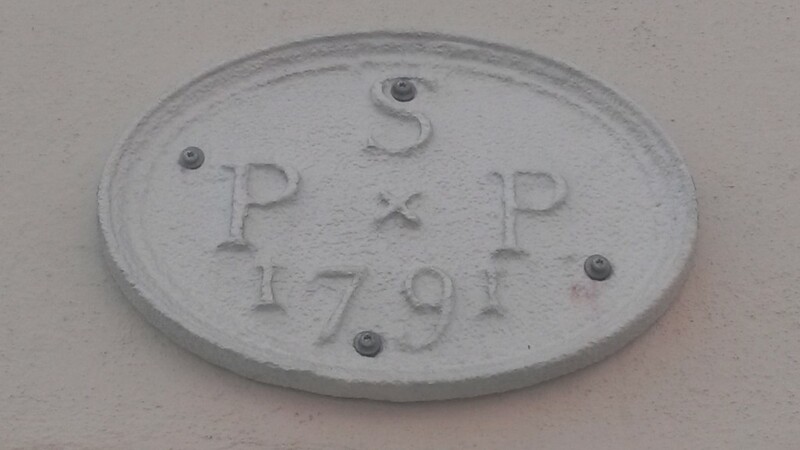 78, an insurance mark, gives a date of 1791. An archaeological survey by David Martin and Barbara Martin of the Institute of Archaelogy at Universtity College London that was commissioned in 1997 by Forfars Bakers – freeholder of the building and occupier of the ground floor – prompted my interest in this curious structure. A copy was given to me by Bruce Gibson who owns the upstairs flat (and whose wonderful Art Deco home on the seafront nearby was the subject of a recent column). 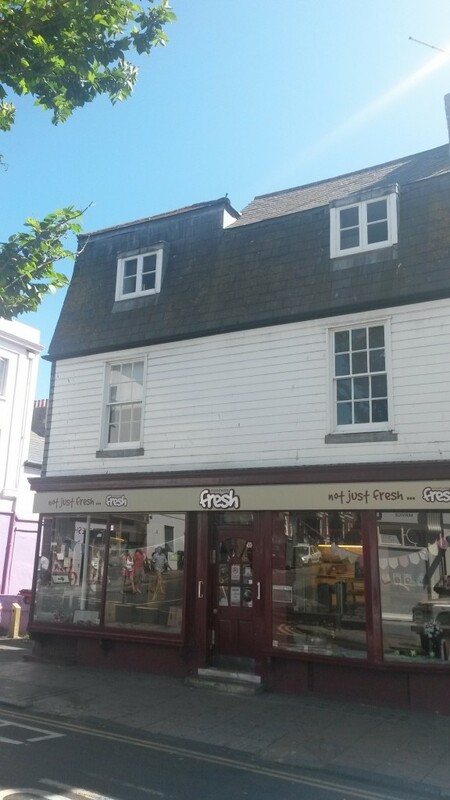 78 James’s Street has a timber (soft-wood) frame and is kept dry by means of weatherboarding. This is in contrast to its neighbours which tend to be of brick (or potentially bungaroosh) construction with lime render to keeps the weather at bay. The building has a varied roofline because the original roof was chopped around to incorporate an extension over its rear elements. The survey, which was carried out when there was no plaster on the internal walls, goes into incredible detail on these points. Its skilled writers describe five phases of development; from a (possibly detached) cottage-like structure to the three-storey bloated building that it is today. An old photograph shows H. Candlin in occupation, a ‘fruiterer’ and ‘greengrocer’. This was during the inter-war period. It was then perhaps a builder’s. There are many clues as to the building’s past. I noticed a disused stone step to the left of the façade beneath a sizeable window. The original entrance was apparently in the middle though which is actually where it is today. The current arrangement of large front windows is clearly a modern intervention. Large panes of glass did not even exist in the 1790s, nor did the type of metal supports that currently hold up the whole façade. Sadly, the basement was not viewed by me nor the archaeologists. It is often the least glamorous areas that give the best information. Dating from 1791 at the latest, 78 St James’s Street was certainly one of the first buildings on the road. A historic home is most appropriate for Forfars whose owners, the Cuttress family, have milled and baked in Sussex since the 1500s.